It's a typical story for families living in the city; their old home is dark and feels cramped, with a poor internal layout not suited to their lifestyle. From London to Sydney to New York, the story is the same. Period homes are forever being updated and remodelled, doing away with the sometimes baffling spatial arrangement these home were originally designed with. 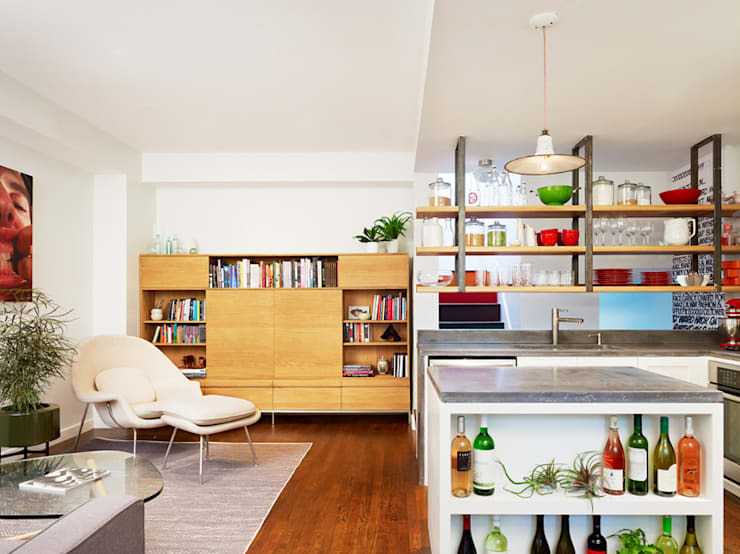 Brooklyn, the New York City borough that has arguably seen the biggest changes of recent years, is where we you will find this detached home that has been remodelled for a young family. The row of houses built in the 1950s have become hot property, laying claim to both front and rear yards, as well as an alley for parking. In just 4 months the home has seen a complete transformation, adapted to suit the busy lifestyle of New York families, all with an eclectic interior that is colourful and modern, perfectly exemplifying the idea that a modern home need not be cold and white. Drawing inspiration from a variety of interior design styles and eras is what makes an eclectic style home so exciting. Every eclectic interior will be completely different, and need not stick to any guidelines required by other, more strict interior design styles. 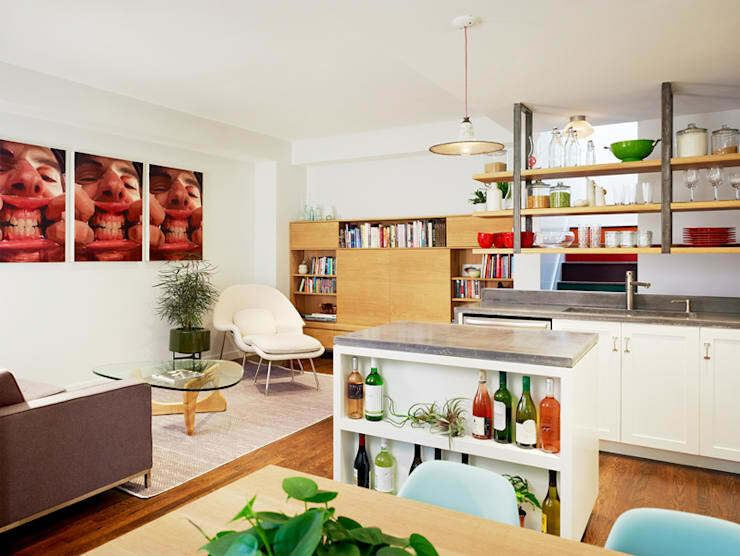 This Brooklyn home sees the introduction of a number of custom made pieces, and a more efficient floor plan. One of the highlights of the project is sure to be the new kitchen, which features custom cabinetry with concrete counter tops. Concrete has moved away from being simply a hard-wearing and functional building material, and is now used throughout all parts of the home not only for its durability, but also for its aesthetics, especially in industrial style interiors. Unbeknownst to anybody not living in the home, the kitchen benchtops are actually flip-top benches, providing access to the storage space from above, rather than using drawers. Through the use of neutral base colours in the white walls and timber flooring, effective pops of colour have been used to give the room a look of vibrancy and positivity. 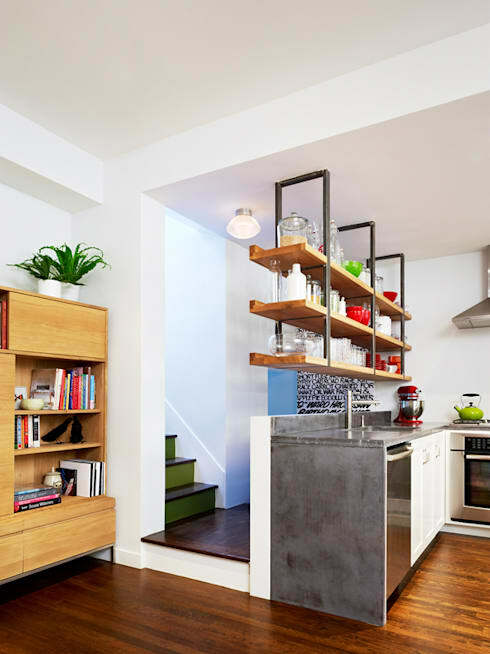 Another custom built highlight is the suspended shelves hanging above the kitchen, which also draw inspiration from the industrial style. 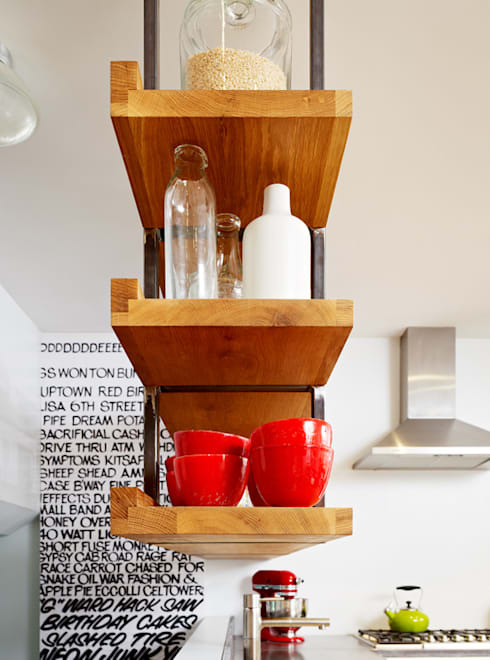 The timber shelves are supported by steel bracing, and were deliberately left exposed to allow light to bounce around the entire space; something often ignored by interiors of mid-century homes. 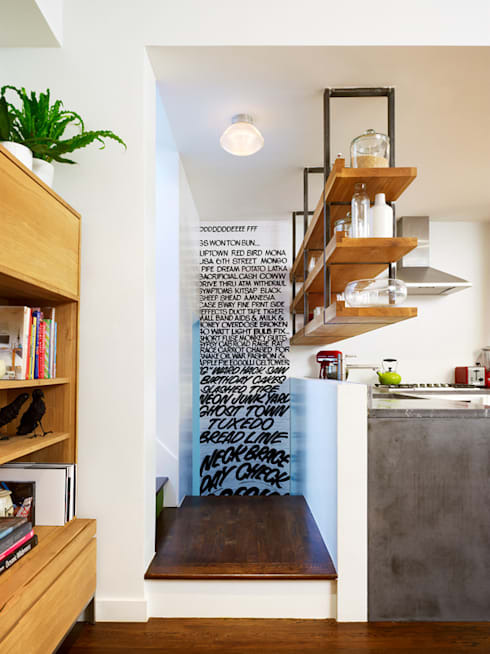 The artwork that dons the wall of the divide between the kitchen and the staircase is a thought provoking piece of typographic pop art, that leads us onto the staircase painted in a tone of green reminding us of an interior from the 60s; yet another element of the eclectic interior. More interesting wall art hangs above the retro lounge area, without looking at all out of place in a room of industrial lamps, indoor plants, concrete, steel, eye-catching colours, and varying tones of timber. The neutral white of the room means once the owners are bored with the interior, the decorations that bring the room to life can easily be switched up for a fresh look. Looking back towards the other end of the home we see the dining area, sat beside a bay window lined with an enviable array of indoor planters. When the warmth of a New York summer allows, the windows and doors can be opened up to bring a breeze of fresh air through the inviting space. Hopefully this interior has given you some inspiration for decorating in the eclectic style, and reminds you that the interior design of your home need not be too serious or strictly adhering to current trends; interiors are all about you, and should be an expression of your taste and personality. Want to see another beautiful interior from the Big Apple? Then check out this stunning Brooklyn penthouse extension.